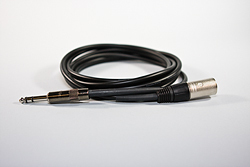 Our Premiere IB00's are balanced 1/4" trs to xlr cables. Cable is Canare Star Quad 4E6S and the xlrs are Neutrik. Neutrik NYS series 1/4" trs plugs or optional studio grade Neutrik NP3X series.